Male candidates above 18 applying for Depot Clerk Jobs must not exceed the upper age of 33 while Female applicant’s age must lie between 18 to 38 years as reckoned on 29-06-2018. Relaxation of 5 years in upper age is applicable for Ex-Serviceman. Applicants who have successfully registered for any of the above Post within the stipulated date will be assessed on the basis of Online Test based on syllabus as per the educational standards prescribed for the post followed by Typing Speed Test. Candidates those qualifying the Written Examination will only be allowed to appear in the subsequent stage. Type-writing Test will assess the candidate’s typing speed on Computer in both English & Hindu language. Combined score of both will grant final appointment following the verification process. 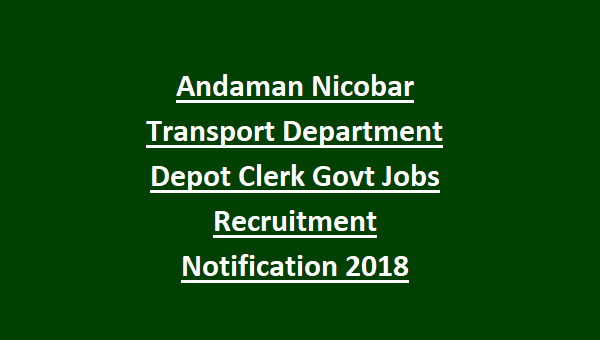 Selected candidates will be appointed to the Depot Clerk Job for a period of 2 years subjected to renewal as per his/her performance. No application processing charges applicable. 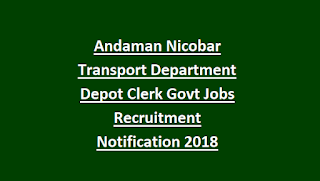 Candidates interested can apply online through the official website https://erecruitment.andaman.gov.in/ before the due date i.e. 24th August 2018.